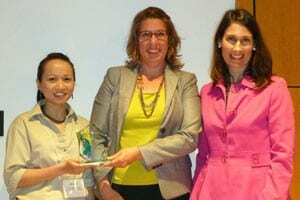 The National Farm Medicine Center (NFMC), Migrant Clinicians Network (MCN), and four partner organizations received the inaugural Stakeholder Collaboration in Occupational Injury Research Award, sponsored by the National Safety Council (NSC). The award was presented May 19 as part of the National Occupational Injury Research Symposium (NOIRS) 2015 in Kingwood, WV. The award recognizes broad stakeholder collaborative efforts in the UMASH project, Seguridad en las Lecherías: Immigrant Dairy Worker Health and Safety. The Seguridad project tests culturally-appropriate, popular education approaches and the promotor de salud or community health worker model to provide health and safety training to immigrant dairy workers in Wisconsin. In the promotor model, lay people are trained to educate their peers. To date, the Seguridad project has partnered with 54 farms throughout Wisconsin, training 737 workers and 37 promotores, totaling to over 2,639 training hours. This effort has resulted in a demonstrated increase in health and safety knowledge among participating dairy workers.